Against a stunning backdrop of thousands of galaxies, this odd-looking galaxy with the long streamer of stars appears to be racing through space, like a runaway pinwheel firework. This picture of the galaxy UGC 10214 was taken by the Advanced Camera for Surveys (ACS), which was installed aboard NASA's Hubble Space Telescope in March during Servicing Mission 3B. Dubbed the "Tadpole," this spiral galaxy is unlike the textbook images of stately galaxies. Its distorted shape was caused by a small interloper, a very blue, compact galaxy visible in the upper left corner of the more massive Tadpole. The Tadpole resides about 420 million light-years away in the constellation Draco. Seen shining through the Tadpole's disk, the tiny intruder is likely a hit-and-run galaxy that is now leaving the scene of the accident. Strong gravitational forces from the interaction created the long tail of debris, consisting of stars and gas that stretch out more than 280,000 light-years. Numerous young blue stars and star clusters, spawned by the galaxy collision, are seen in the spiral arms, as well as in the long "tidal" tail of stars. Each of these clusters represents the formation of up to about a million stars. Their color is blue because they contain very massive stars, which are 10 times hotter and 1 million times brighter than our Sun. 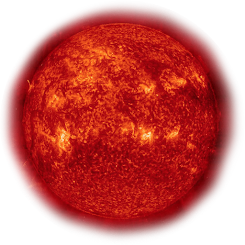 Once formed, the star clusters become redder with age as the most massive and bluest stars exhaust their fuel and burn out. These clusters will eventually become old globular clusters similar to those found in essentially all halos of galaxies, including our own Milky Way. 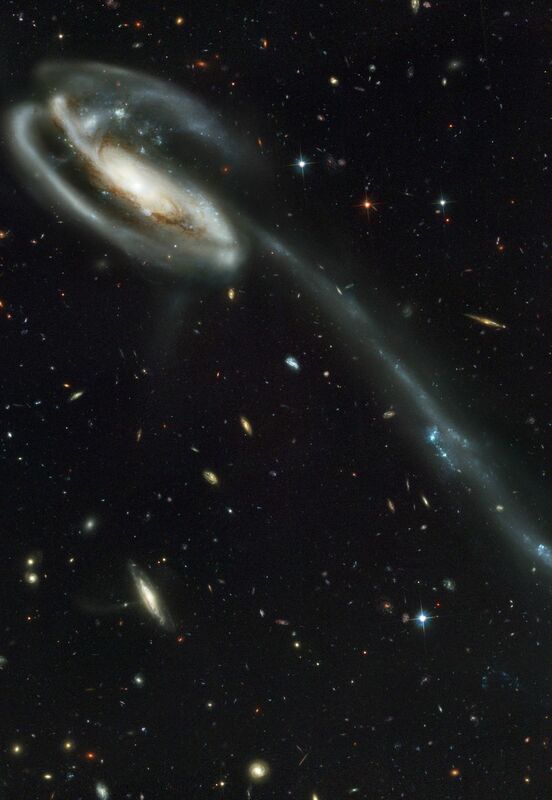 Two prominent clumps of young bright blue stars in the long tail are separated by a "gap" — a section that is fainter than the rest of the tail. These clumps of stars will likely become dwarf galaxies that orbit in the Tadpole's halo. The galactic carnage and torrent of star birth are playing out against a spectacular backdrop: a "wallpaper pattern" of 6,000 galaxies. These galaxies represent twice the number of those discovered in the legendary Hubble Deep Field, the orbiting observatory's "deepest" view of the heavens, taken in 1995 by the Wide Field and Planetary Camera 2. The ACS picture, however, was taken in one-twelfth the time it took to observe the original Hubble Deep Field. In blue light, ACS sees even fainter objects than were seen in the "deep field." The galaxies in the ACS picture, like those in the deep field, stretch back to nearly the beginning of time. They are a myriad of shapes and represent fossil samples of the universe's 13-billion-year evolution. The ACS image is so sharp that astronomers can identify distant colliding galaxies, the "building blocks" of galaxies, an exquisite "Whitman's Sampler" of galaxies, and many extremely faraway galaxies.